New geoarchaeological evidence indicates that early modern humans may have ventured out of Africa and through southern Arabia, instead of the Levant. New evidence from the Blue Nile and other locations in Africa suggests that the main formation of the East African Rift Valley coincided with major turns in human evolution, suggesting that tectonics played a major role in evolution. Did modern humans evolve because of climatic or tectonic changes? Did one cause the other? 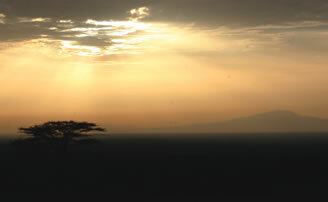 Do you think tectonics or climate played a larger role in human evolution in Africa? Did volcanic eruptions kill the dinosaurs? Toxic gas caused the Great Dying? The Nuclear Regulatory Commission has received the first in an expected flood of permit requests to build new nuclear reactors in the United States — something that hasn’t been done since the 1970s. The nuclear energy industry hopes it marks the turning tides from a carbon-based to a nuclear-based country. The 1982 Woburn toxic water case became a best-selling book and blockbuster movie, and is now used in a mock trial format in a classroom at Ohio State University, much to the benefit of the students who participate. Consider the changes that have taken place in the climate debate over the last 10 to 20 years — in the 1980s, “global warming” had hardly been heard of and today, there are mainstream movies about it. How can a textbook writer or a teacher keep up? Politicians are all talking about climate change and trying to enact their own bills, but the politics of energy and climate, like politics in general, tend to be local. Will 2008 mark the “tipping point” in climate policy? Can nuclear power make a Michael Jordan-caliber comeback in the United States? Only time will tell. 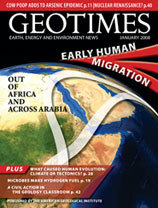 New research indicates that humans may have migrated across southern Arabia on their historic trip out of Africa. AGI/NASA.